In Stockport, a long-term scheme of urban gentrification is improving the centre of the town. 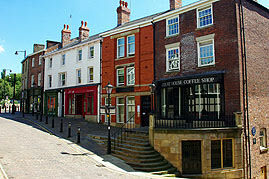 The historic buildings in Mealhouse Brow, the Market Place, and Rostron Brow had fallen into disrepair, in spite of many of them being listed. The ‘Future Stockport’ project required for all the owners and tenants to be moved elsewhere, as the buildings required complete structural renewal behind the retained facades. Our surveyors entered into negotiations with the landlords and tenants, to understand their needs and find out how disruption could be minimised. As part of that process we were able to estimate the level of compensation that would need to be included in the project budget. We were then able to manage the process of gaining a Compulsory Purchase Order for the Council, to enable the project to go ahead. With the Order in place, we were able to begin to acquire the properties for the Council. Of the trading businesses affected, we offered some of them help to move permanently, while others were offered temporarily relocation to alternative premises. In each case, we sought to obtain the fairest balance between the needs of the businesses to avoid lost revenue, and the need of the client to keep the project viable by minimising cost. By building good relationships and maintaining clear communication, we were able to acquire all the properties on a voluntary basis, without any need for recourse to a Lands Tribunal to resolve any disputes.